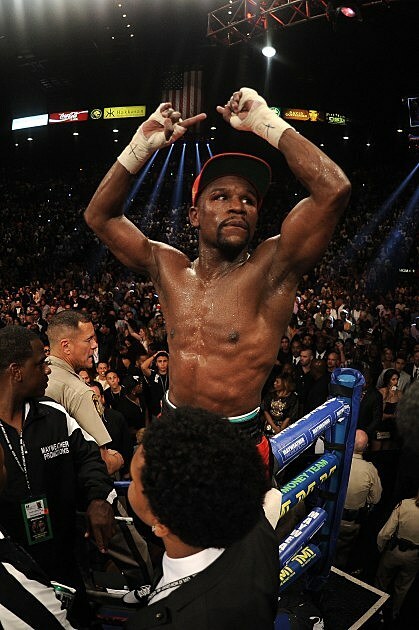 Grand Rapids native Floyd Mayweather, Jr., remained unbeaten in professional boxing on Saturday night. In a match against Marcos Maidana at MGM Grand Garden Arena in Las Vegas, Mayweather improved to 46-0 with a majority decision in the welterweight world championship unification bout. Mayweather, who has 26 knockouts, outpointed the 10-to-1 underdog Maidana with a majority decision for the WBC and WBA titles. Justin Bieber and Lil Wayne were was in Las Vegas to support their friend, Mayweather, for the match. Mayweather posed with Bieber and Wayne in the locker room before the two music stars escorted him out into the ring as part of the traditional pre-fight ritual. Bieber has been in Las Vegas for a few days now, sharing with his fans on Instagram photos and video of him hanging with Mayweather as he prepped for his fight and even getting a spa treatment. After the fight, heavyweight boxing legend Muhammad Ali, who lives in Berrien Springs part of the year, tweeted about Mayweather.